We know snail mail is sending by post office, it looks slow but still working fine. Most young people like use email, but sometimes we still need snail. 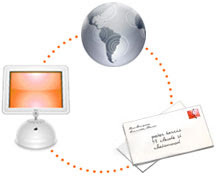 Do you know we can send snail mail by internet? Yes, we can. Why we have to send snail mail by internet? Why we are not use email directly instead of snail mail? I personal think some people like snail mail, it is not everybody have computer, and convenient for internet snail mail. Today I would like introduce two these kind of services here. Snailmailr is a web service that helps you compose mail online and send it by local post office. You can fill envelop and compose mail on this site, and pay your bill - $1 US dollar (included stamp). All done, it will manage your mail, like print, seal mail and delivery. But this service only cover US, maybe it will do international business in the future. L-mail is another "internet to snail mail service" that also lets you write mail online, print and delivery. This is worldwide service, it has some print place in different countries, so it makes international mail delivery faster than regular - by day. If you are interesting about these services you can check out two sites. They are little bit different.